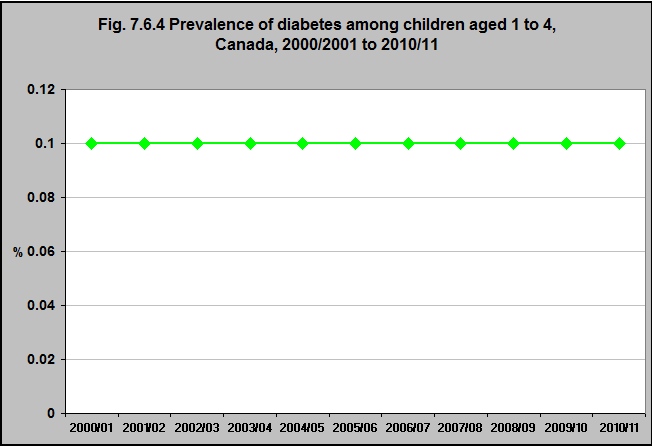 Source: CICH graphic created using data adapted from the Public Health Agency of Canada, Canadian Chronic Disease Surveillance System 2000-2001 to 2010-2011, customized analyses from a subset of the data from Chronic Disease and Injury Indicator Framework, Data tool, edition 2014. http://infobase.phac-aspc.gc.ca:9600/PHAC/dimensionMembers.jsp?l=en&rep=i3212B12F133F4CE88AD13DB60CA37237&s# – accessed June 24, 2017. In 2010/11, the prevalence of diabetes among children aged 1 to 4 years was 0.1%. This was unchanged from 2000/01. Diabetes among young children is mainly type 1 diabetes – which has genetic risk factors along with environmental triggers. Therefore, it is not surprising that there is not a significant variation from year to year.